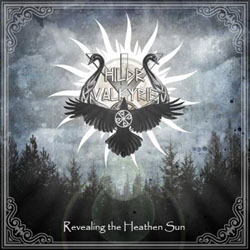 Hildr Valkyrie, the one-woman heathen metal band from Athens, Greece will release its second full-length album “Revealing the Heathen Sun“on November 3rd, 2017. The band has unveiled the cover artwork made by SET Inside (Russia) and its new logo made by Bob Gys from Belgium! “Revealing the Heathen Sun” has been reamped-mixed and mastered at WSL-Studio (France) and it will be released by the Russian label Stygian Crypt Productions. The upcoming album will be out 9 years after the debut album “Shield Brothers of Valhalla” and the improvement seems huge, based on the recently released first official video clip of the album “The Rune’s Song“! Hildr Valkyrie (Angela-Kelly Antoniou) will also participate as guest vocalist for the song “An Ode to Wisdom” from the upcoming Celtefog EP “A Faded Wisdom“.